Ulster Rugby are 2/2 from their opening two league fixtures. Both games were proverbial cliffhangers where the side had to show resiliency and skill to win late against Scarlets and Edinburgh Rugby. John Cooney was the hero with his game winning penalties in recent weekends but the statistics show the good start made by the side with the new arrivals particularly shining. 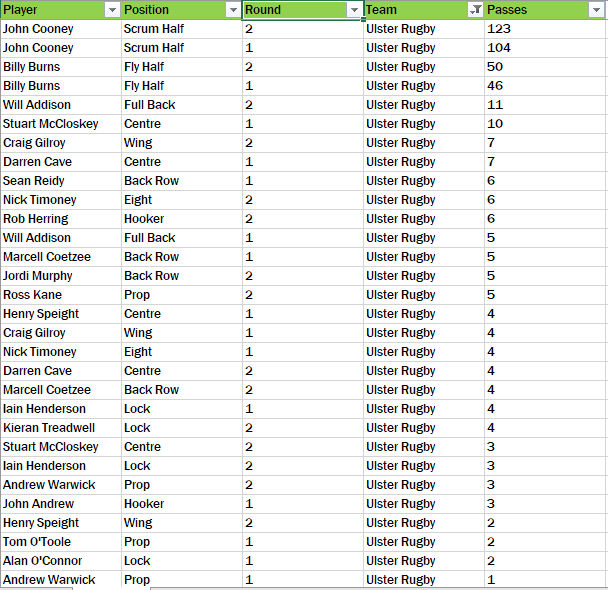 The one thing that leaps out on the meters gained statistics is how potent the Ulster Rugby back line has being early doors this season. There was fear given the retirements (Bowe, Trimble, Payne) and departures (Piatau) that there would be a massive void in the attacking side of the team. Think again, as the likes of Craig Gilroy have made serious statements of intent early doors. Gilroy’s ability to create with ball in hand seen in his statistics; averaging 9.06 meters per carry last weekend alone. Speight and Addison look astute signings early doors and their numbers are incredibly strong. John Cooney’s ability to support the ball carrier seen with his excellent numbers; the form nine in Ireland at this time. The tackle count statistics will be music to the ears of national team coach Joe Schmidt as Ireland internationals Iain Henderson and Rob Herring were sensational in this aspect of play last weekend. Eighteen tackles is exceptional from Henderson along with Herring’s performance last weekend with sixteen tackles (considering it was his seasonal debut). Kudos also to Nick Timoney as well; the back row even at this early stage of the season has elevated his game to another level this term with some key contributions. His tackle count here is excellent along with Cave and McCloskey. The game plan from Ulster Rugby is clear to see from this statistic; expansive style, look to pass / offload at every given opportunity. Cooney’s numbers are sensational and his quick passing has provided Burns with the time to launch his three quarters who have also looked to keep the ball alive with offloads. Will Addison’s passing stats are particularly noteworthy, looking to bring players into the play with swift offloads. 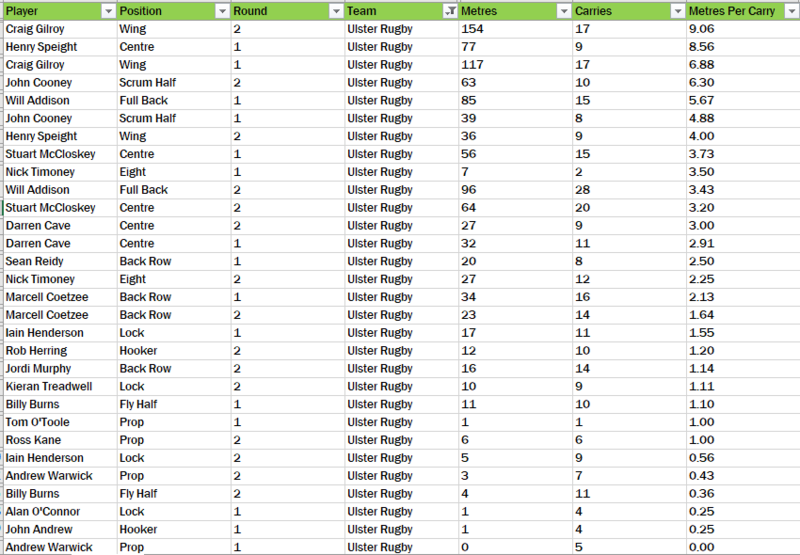 The half back numbers are well and shoulders above the other Irish provinces and if Ulster Rugby can continue to develop their defense structures and squad depth throughout the year, they could be a dark horse to make a serious push for the playoffs. Three tries scored and conceded in the first two rounds of the league, all scored against Edinburgh Rugby in the second half from the starting lineup. Scarlets game was a tight affair with defenses on top. John Cooney’s form in open play and kicking has being sensational and if / when he is called up by Ireland in November, it will be interesting to see who from the squad will fill the void. Squad depth is the concern right now for Ulster Rugby because the starting lineup at the moment are playing with determination, hunger and skill. Two tricky road trip assignments for Leinster Rugby have being negotiated; six points from trips to Cardiff Blues and Scarlets is a decent start to the season given the personnel not available for selection. Hawkeye Sidekick has had a look at the Leinster Rugby XV starting selection and the statistics show a side whose squad depth and skill set is extremely high. 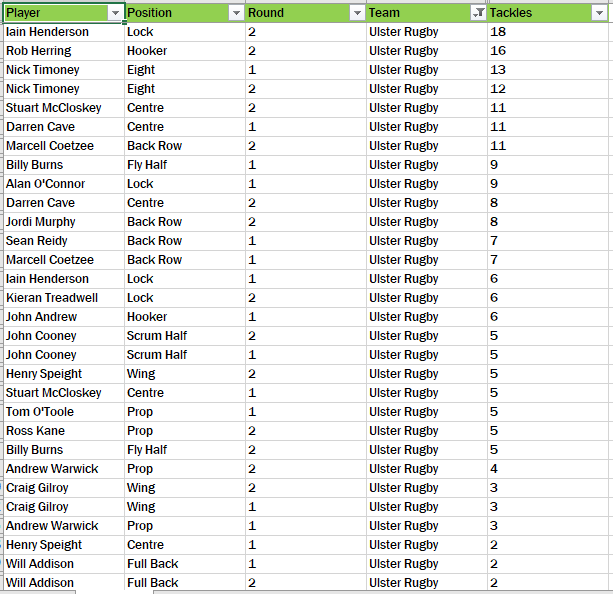 Interesting statistics in this facet of play particularly in the fly-half position. Ross Byrne was prominent with ball in hand as he gained 32 meters during the opening round victory over Cardiff Blues but his carries against Scarlets last week was significantly reduced; just the five carries for no meters gained indicating more focus on game management and getting the back three running with the ball evident in McFadden and Lowe’s statistics last weekend. There is a lot for Leo Cullen and Stuart Lancaster to be happy in this report. The opening performance of Robbie Henshaw was excellent and Rhys Ruddock’s work rate with the number of carries is to the fore. As you can see, squad depth was well tried in the opening two rounds of the Guinness Pro 14 and when you consider Sexton, O’Brien, Ringrose and Ryan have yet to feature, it is a testament to the squad depth at the province. The Scarlets contest in round two was a high caliber contest. Scarlets enjoyed good periods of dominance and it was reflected in the Leinster Rugby tackle count statistics. 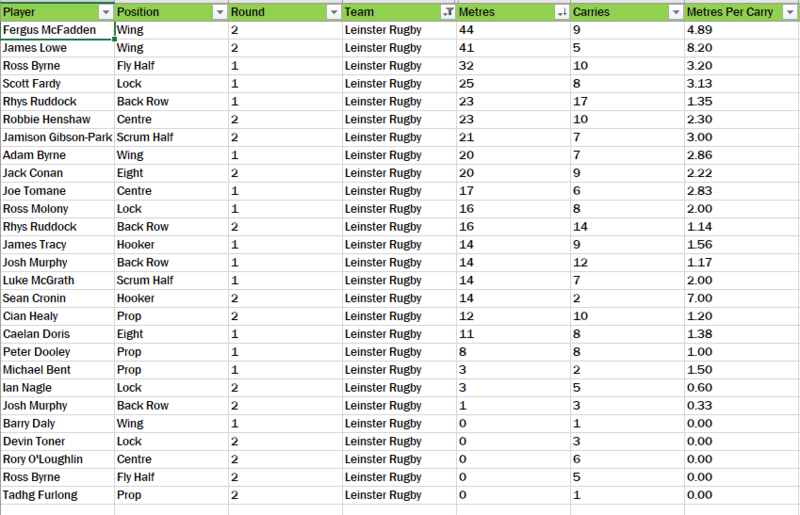 Six Leinster Rugby players last weekend made 10+ tackles with Ross Byrne doing a marvelous job in the ten channel. Furlong, Healy, Henshaw, Cronin and Josh Murphy showed well in this statistic; strong opening fixture cameos from the international contingent. Cardiff Blues was a far fluid contest and the tackle count statistics perhaps tells this story. 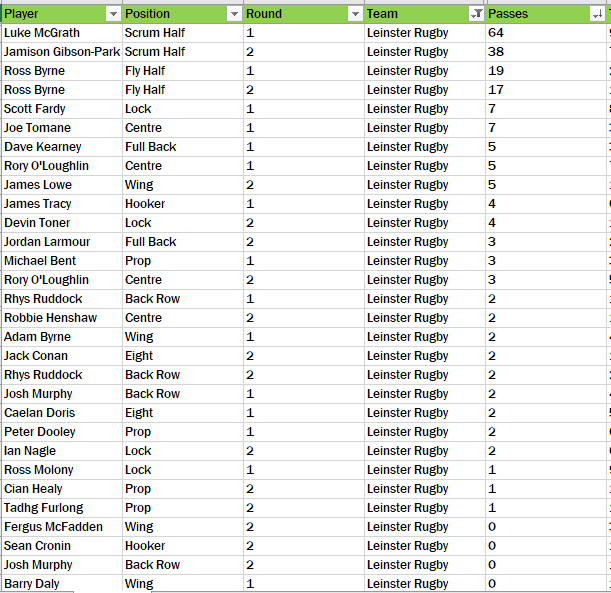 Leinster Rugby grew into this contest and the tackle count reduced in the third and fourth quarter which indicates the low tackle count tallies. Luke McGrath led the statistic with nine tackles along with Ross Molony in the pack. Outstanding statistics from a team dynamic perspective; players work ethic is typified in these statistics and it is only September! This statistic could be scary come European Champions Cup time of the season. Ross Byrne has stood out in these opening two league fixtures; has looked to create line breaks with quick, incisive passing to his back line. Solid numbers produced. Fardy’s ability to offload and connect play evident in the opening round fixture statistics; superb footballer. Six tries scored so far, evenly spread out between starting lineup players and players coming off the bench. Cardiff Blues’ game saw the bench impact with Brian Byrne and Jamison Gibson-Park cross over. Scarlets’ game saw McFadden, Lowe and Ruddock score. Six tries conceded with four leaked against Cardiff Blues but the defensive side of the ball will improve as the season progresses. Two home games so far for Connacht Rugby and the new managerial era of Andy Friend, one loss (narrowly) and one emphatic win has shown the potential and the scope of improvement required from the West of Ireland province to get to the next level this season. 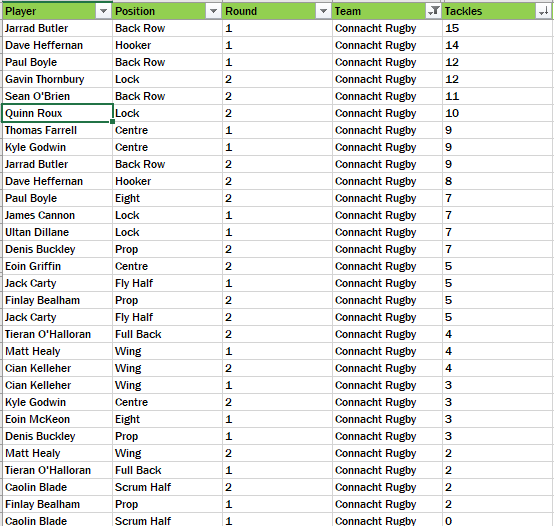 Hawkeye Sidekick has being number crunching the starting lineup statistics for Connacht Rugby in the first two rounds and some interesting statistics have emerged. Connacht Rugby’s ethos to run the rugby ball is well known and this particular statistic showcases the talent on show in the side. Cian Kelleher tops the chart with his opening round cameo; a game where he received the ball thirteen times and made 141 meters; a whopping 10.85 meters per carry which is indicative of how the wingers has gone during preseason. Tiernan O’Halloran produced solid numbers with ball in band; his meters per carry will above 6.5 which is impressive. Tom Farrell looks primed for a superb second season if his opening statistics with ball in hand against Glasgow Warriors are anything to go by. Jarrad Butler has led from the front; his work load against Glasgow exceptional. 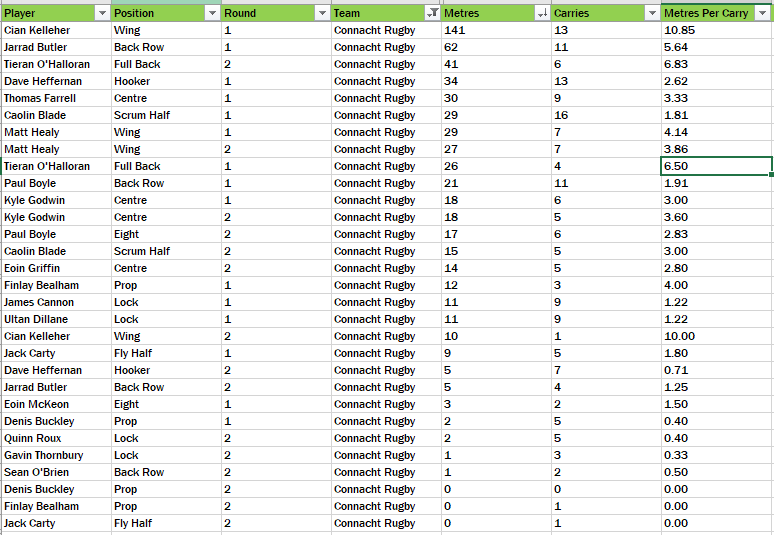 The tackle count tallies for the opening round fixtures show a contrasting level of tackles from the starting fifteens. 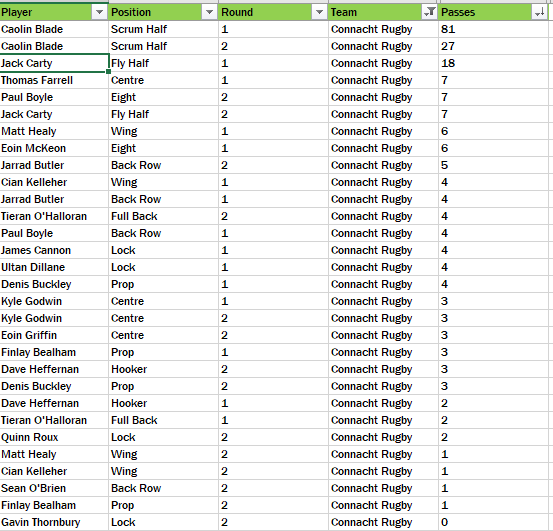 Glasgow Warriors tackle count was high and seen with Butler, Heffernan and Boyle charting highest. The Zebre Rugby game saw the hosts very dominant during proceedings with Gavin Thornbury topping the tackles made chart with twelve. Butler has being outstanding in this facet of play (24 tackles so far), great captaincy choice and leading by example. A statistic which threw up a couple of interesting numbers. Caolin Blade at scrum-half as you would expect leads the chart with a whopping eighty-one passes against Glasgow but look at the passing statistics for round two, just twenty-seven passes during his cameo; evident in the fact that the scrum-half was deployed out wide to create attacking opportunities for his side at different intervals. Blade’s direct running has being a success for the side this season. Carty’s statistics are strong too; playing conditions dictating the number of passes in the second round fixture. Farrell and Boyle impressed with ball in hand as well as passing to team colleagues looking to create in around the fringes. The good, the bad on both set pieces. Line out during round two in the opening period was a lottery given the slick weather conditions with a couple of Zebre Rugby steals when Connacht Rugby were in the red zone. Heffernan has grown into the starting role so far and with Delahunt for competition, both players should evaluate their game to the next level. The restarts are very much a work in progress; it was ruthlessly exposed last season by various teams and Glasgow Warriors benefited from unclear restart strategy in round one; a facet of play which needs Connacht Rugby to improve upon and will look to collate numbers on this as the season progresses. A solid start to the season but a key three game stand looms large starting with Edinburgh (A), Scarlets and Leinster Rugby (H). Reaction to Munster Rugby’s defeat to Glasgow Warriors last weekend drew some over the top fan reaction. The performance was indicative of a team who did not get to the pitch of the game due to a lack of competition in their opening round fixture. 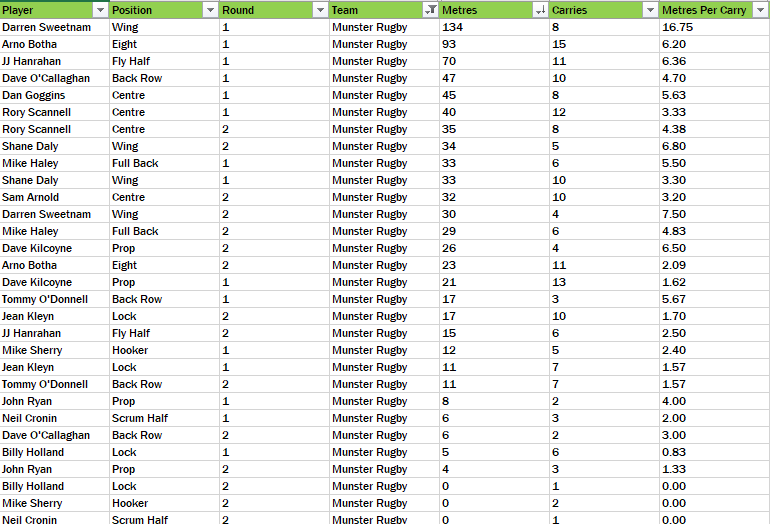 Hawkeye Sidekick has reviewed the statistics for the Munster starting lineups in the opening two rounds and the verdict is in. When you start to pick the analysis from last weekend’s loss to Glasgow Warriors, you just have to compare the statistics from round one and the emphatic win over a disappointing Cheetahs side at Thomond Park to the statistics generated during the round two loss at Scotstoun. The two games were so contrasting. If you look through these numbers, it provides some interesting side notes. 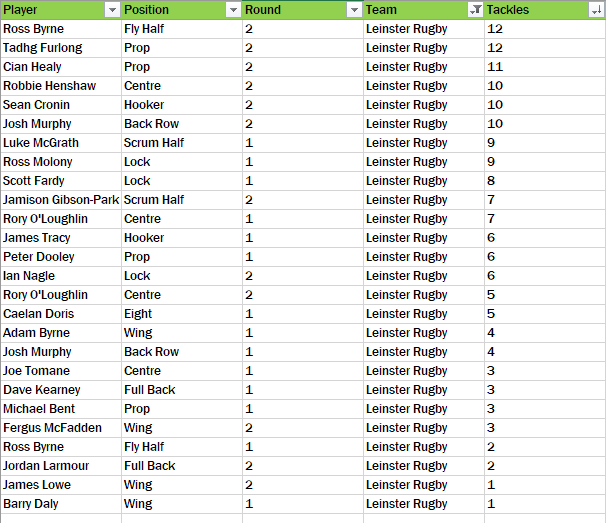 Rory Scannell and Mike Haley’s numbers with ball in hand are very consistent; good cameos from both players. The emergence of Darren Sweetnam from an excellent preseason is seen in his first two outings; his meters per carry are incredibly good (10.75 and 7.50) in his two games. Glasgow Warriors defensive line speed in contrast to Cheetahs is seen on the numbers produced by Munster Rugby. The numbers are significantly lower and it illustrates that Munster Rugby were not helped by the fact that Cheetahs were massively outclassed at Thomond Park. This is always an interesting statistic; see where players are expending their energy and who is going over and beyond the call of duty in preventing opposition gain line breaks. The Glasgow Warriors round saw the side having to go deep into their tackle count. I am delighted to see Tommy O’Donnell score so high in this discipline; his performances so far have being incredibly on point and the tackle count of 17 and 19 in consecutive games so far bodes well for the season. Jean Kleyn and Arno Botha statistics in these opening games have being impressive; the Glasgow Warriors fixture saw them top the tackle chart with 19 and 20 tackles respectively. Botha has being superb, astute signing from the province and the other back row options vying for starting time will have their work cut to dislodge the back row such is his form so far this season. 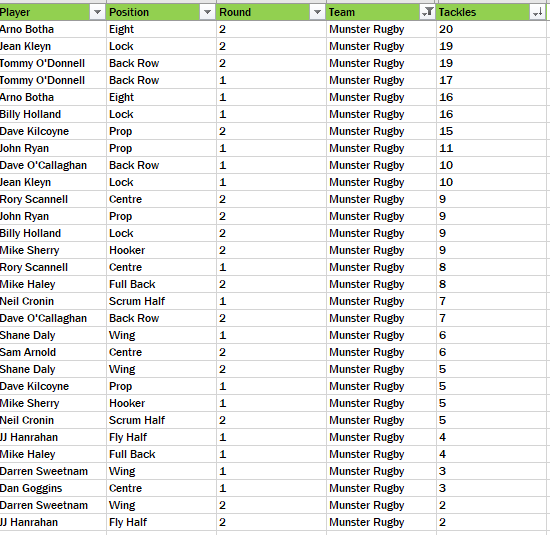 John Ryan and Dave Kilcoyne work rate seen to good effect in their tackle count numbers. A contrasting two opening fixtures for the respective Munster Rugby starting lineups particularly in the half back division. Such was the dominance enjoyed by Munster Rugby in their opening round fixture, the half backs saw plenty of possession to pass to their team colleagues. Glasgow fixture was a complete different story; Cronin only passed thirteen times and JJ Hanrahan for his cameo only passed the ball seven times. The second round fixture statistics across the starting lineup dipped dramatically except for Mike Haley who is consistent at six passes for both fixtures. Sweetnam’s lack of influence on proceedings seen by the fact that he never passed the ball throughout the Glasgow Warriors contest. A telling statistic. The starting lineup has accounted for six of the seven tries so far in the opening two rounds. Rhys Marshall’s try against Glasgow Warriors the only try to come from the bench. Early days yet but try count from the bench will be an interesting statistic as the season progresses starting with a key playoff fixture (even this early) to a rejuvenated Ospreys outfit this Friday night. Nineteen line outs executed so far this season and Munster have won fifteen but it is the ones that misfired which will be talked about. 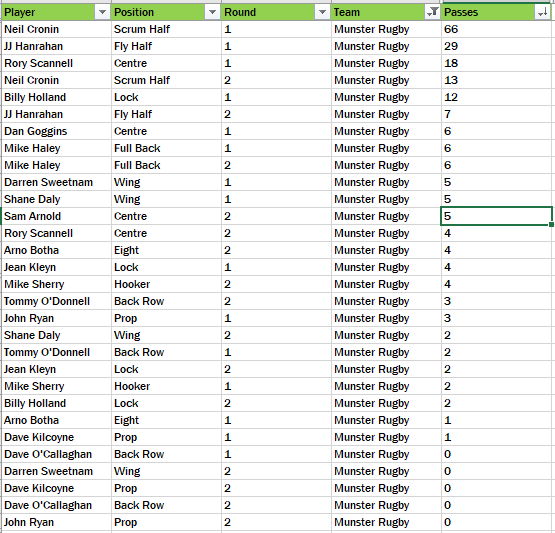 The Glasgow Warriors game saw inaccuracy in this department particularly in the five meter line out at the end of the contest, a statistic which Munster Rugby which need to improve upon to allow their maul game to prosper.